It’s tough being a New Jersey birder. Jersey has always gotten a bad rap in general (the smells of the turnpike, the Jersey shore, the governor), and in the world of birding, the state often seems to be symbolized by two words: Cape May. And yes, Cape May is incredibly wonderful, with its hawk watch and its migrant birds funneling through in fall, but there are other wonderful places in which to bird in the state. (During the past week, for example, birders have been flocking to a backyard in northwest New Jersey to see a Common Chaffinch.) The state comprises diverse habitats that range from ocean coastline to pine barren forests to grasslands to highland woods to bayshore marshes. The New Jersey Bird Records Committee (NJBRC) documents 465 species of natural origin. This places New Jersey in the top third of our 50 states, which isn’t bad at all when you realize that New Jersey is one of the smallest states geographically. I don’t know if anyone has ever calculated birds per square mile, but I’m betting that New Jersey would be at the top of the list. 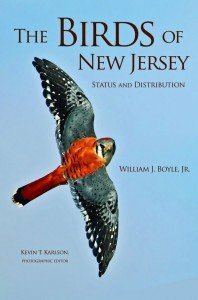 If you want to find birds in New Jersey, you need A Guide to Bird Finding in New Jersey, Revised and Expanded (Rutgers Univ. Press, 2003). If you want to identify birds you see in New Jersey, you need one of the several excellent field guides to birds in the eastern United States. And, if you want to understand what you have seen, whether the bird in your binocular field is a common everyday bird, or a common everyday bird never before seen in January, or a very unusual bird (like a Common Chaffinch), then you need this book, Birds of New Jersey: Status and Distribution, by William J. Boyle, Jr., published by Princeton University Press. The purpose of The Birds of New Jersey is “to provide an authoritative and up-to-date account of the status and distribution of New Jersey’s birds, at the end of the first decade of the twenty-first century” (Introduction). It does so with authority and style. Bill Boyle is the author of the previously cited A Guide to Bird Finding in New Jersey, dear to the heart of every Jersey birder. He is also a longtime member of the New Jersey Bird Records Committee, and has a place in birding history as a member of the legendary team that won the first World Series of Birding (the other members were Pete Dunne, Pete Bacinski, David Sibley, and Roger Tory Peterson). The heart of the book is the “Annotated List of Species”. Each bird is described in terms of abundance status, current and historically; where the bird is usually found in the state; the months the bird is likely to arrive and leave if it is a migrant, and, for accidentals, record dates. The text is brief, to the point, and often surprisingly interesting. There is the story of the Northern Parula, for example, a bird that in the early years of the 20th century bred in southern Jersey, and rarely and locally bred in the northwest of the state. Northern Parula used Unea Lichen for their nests, and when air pollution affected the lichen in the mid-1950’s, the bird became rare in the south and extirpated in the north. Fortunately, Northern Parula started returning in the 1970’s, and is now commonly seen during fall and spring migration and the summer. So, the next time you see Northern Parula in New Jersey, give a little cheer. There are, sadly, entries for extinct species. Carolina Parakeets damaged an apple orchard in East Orange in the 1850’s. A Passenger Pigeon, one if a flight of ten flying over Morristown, was shot in 1893, the last record of this species in New Jersey. This is a well-designed, attractive book. Brightly-colored range maps accompany every bird entry (except the extinct ones). Two hundred photographs, selected by photographic editor and bird photographer extraordinaire Kevin Karlson, illustrate approximately half the species described. Kevin has taken half the photos; the others are by various birders lucky enough to see some of New Jersey’s best rarities, including Sandy Hook finder-of-rarities Tom Boyle (no relation to Bill that I know of) and New York City birder/photographer Lloyd Spitalnik. They are all printed with excellent color clarity. 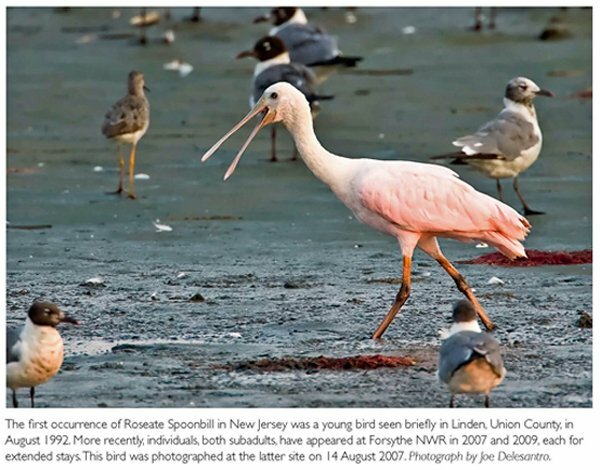 A 14-page section in the middle of the book pulls together a cross-section of common New Jersey birds and rarities, including the ones pictured here: the Roseate Spoonbill that appeared at Forsythe NWR in 2007 (taken by Joe Delesanro) and Kevin’s photograph of an Osprey that nested in North Wildwood in 2002, symbolic of the success of the DDT ban. My personal favorites are three photos of the 2009 Cape May Ivory Gull. I saw the gull, it was an incredible bird, and I have my own photo of Kevin lying on the ground photographing the bird (probably not the photos in the book, I’m sure he took thousands of photos during the two weeks the Ivory Gull was at Cape May). The current data in the species accounts is based largely on Birds of New Jersey (1999), supplemented by more recent data reported through the NJBRC, local and national journals, and eBird. 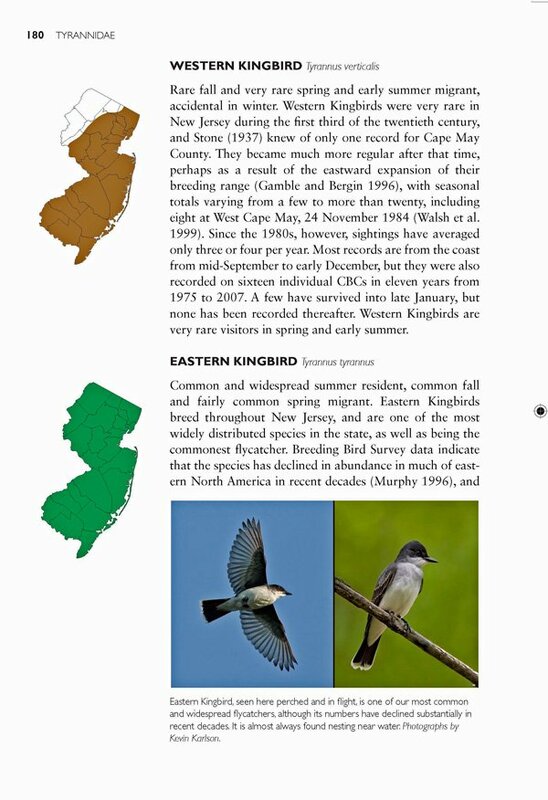 Birds of New Jersey, written by Joan Walsh, Vince Elia, Rich Kane, and Thomas Halliwell, published by New Jersey Audubon Society, was a landmark volume; 704-pages long, it presented results of the 1993-1997 New Jersey Breeding Bird Atlas. It also reported on state migration patterns and rare bird records. It was one of the first books I bought when I started birding New Jersey, and its wide black binding with big white lettering has been staring me in the face for the past four years. It’s a great reference book, but, I confess, a book I seldom use. The Birds of New Jersey: Status and Distribution lacks the statistical density of the 1999 volume, but, at 308-pages and in paperback, it is portable. With its photographs and colored maps, it is a pleasure to look at and use. It is also, of course, more up-to-date. In the twelve years between these two books, the New Jersey checklist has expanded from 443 to 465 species. 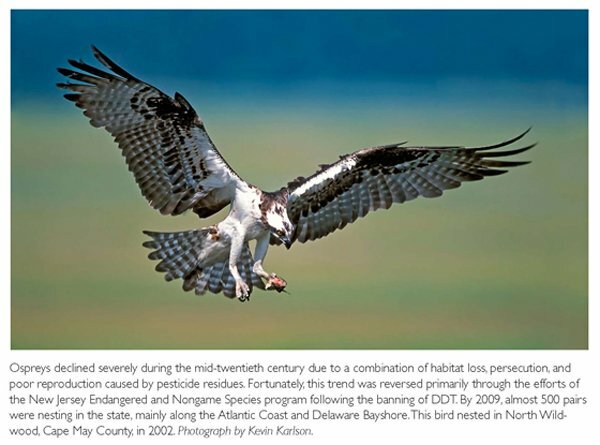 Development, conservation, and climate change have affected bird distribution in good ways (a record 282 Bald Eagles found on the January 2009 official count!) and bad ways (overharvesting of horseshoe crabs resulting in the drastic decline of Red Knots in Delaware Bay). Leafing through The Birds of New Jersey: Status and Distribution is like hanging out with a group of long-time Jersey birders and listening to stories of past rarities, notable birding irruptions, changes, trends. Of course, these are stories of over 460 species, condensed and informed by research gleaned from ornithological literature dating back to 1869. The 13-page bibliography attests to Boyle’s scholarship. Should you buy this book? If you are a Jersey birder (and I’m using the term in the loosest sense, referring to birders from all states and countries who bird the Garden State), this is a book that will enhance your birding activities. It will give context to your sightings and, if you are new to Jersey birding like me, help you learn the migration and breeding trends of the state. Experienced and scientifically-inclined birders will probably still prefer Birds of New Jersey (1999). But, I think these birders would enjoy this book too, with its invitation to happily relive state rarities. As I was writing this review, I received an e-mail from Scott Barnes, New Jersey Audubon senior naturalist, announcing the organization’s new NJ eBird Portal. It is a reminder that we are amassing great quantities of data on birds that we never had before, and that our knowledge of our birds will always be changing. So, if you already have The Birds of New Jersey, get out your pencil and start annotating. Start with Common Chaffinch, with a question mark. And, tell me, what do you think will be the next Big New Jersey Rarity? And, where in the state will it be found? The Birds of New Jersey: Status and Distribution. by William J. Boyle, Jr.; photographic editor, Keven T. Karlson. Princeton University Press, 2011. 320 pages. All photographs used in this article are courtesy of Princeton University Press. I have quite a number of great sightings from the Garden State including the aforementioned Chaffinch, and while I concur with your assessment that Cape May is “incredibly wonderful” PLEASE HAVE THE STATE’S ROAD ENGINEERS SUMMARILY EXECUTED. Donna, I’m new to birding, and I appreciate the explanation of what this book is about. I didn’t realize there were so many different kinds of books about birds. I don’t know what the next Jersey rarity will be, but I am hoping it will be some kind of hummingbird. I love watching them. I started a series called INEVITABLE IN NJ a while ago at http://birdingnewjersey.com Have to write a few more entries. @Arie – You don’t like jug handles on your roads? Well, the Staten Island Hooded Crow did end up in NJ, so maybe the Hunterdon County Chaffinch will find its way to Queens. @Allie – There has been a Rufous Hummingbird at the Cape May Bird Observatory Goshen Center for a while now. This is an unusual bird for NJ, so if you live in the area, try to see it. And, then plan a trip to Arizona, where you have lots of hummers. @Rick – I like your choices for Next Big Bird in New Jersey – Neotropical Cormorant, Little Egret, and Inca Dove. Especially Little Egret. Hard to believe it hasn’t shown up yet. Any day now, we just need to look for that plume. I know nothing about birds! I live in DE and am very curious about what I saw yesterday: very large bird – over 2′ tall (maybe 3? ), brown with long legs. Not sure if it flies. I watched it for about 15 mins. walk very slowly thru the neighborhood. If someone can identify this, please let me know. Many thanks! Where Are You Birding This Third Weekend of August 2011?